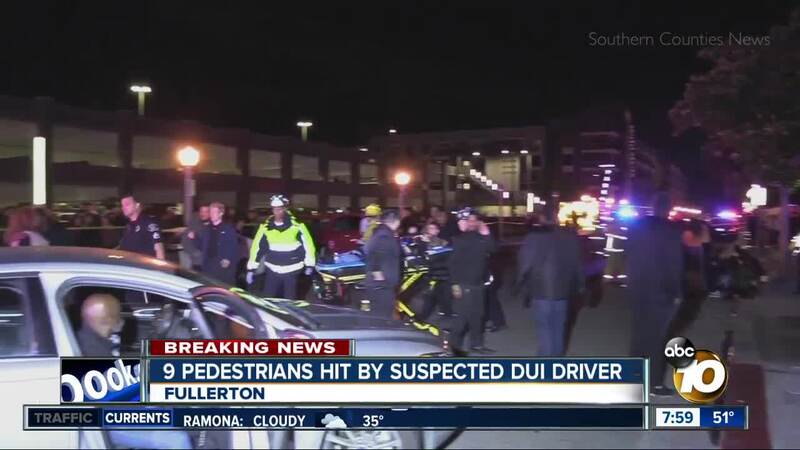 FULLERTON, Calif. (KGTV) -- Nine people were rushed to the hospital after being hit by a driver suspected of driving under the influence in Fullerton Sunday, KTLA reports. The incident happened around 1:50 a.m. on the 100 block of West Santa Fe Avenue. According to police, Christopher Solis, 22, of Anaheim was driving a Toyota Tacoma when he hit the victims before slamming into a tree and coming to a stop on a sidewalk. "With the help of some nearby Good Samaritans, FPD officers were able to lift the Toyota Tacoma enough to free the pedestrians who had been struck and were now stuck underneath it,” police said in a statement. The victims, ranging in age from 18 to 49, were taken to trauma centers with injuries ranging between moderate and life threatening. According to KTLA, Solis was arrested on suspicion of felony DUI causing great bodily injury. He is suspected of driving under the influence of drugs.